You’re probably wondering what on earth I’m talking about. Yes, pesto! 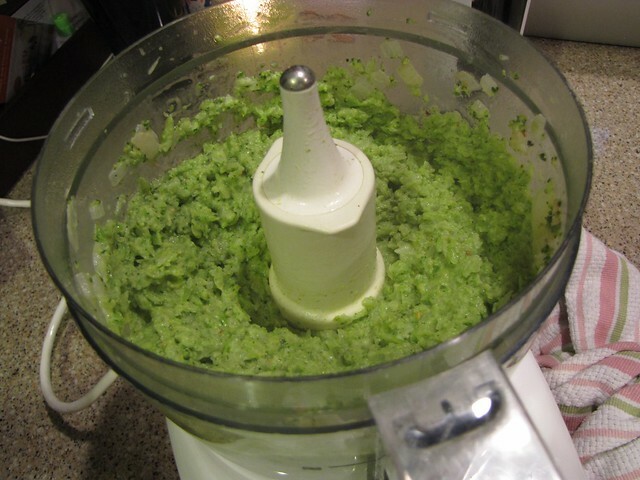 The green stuff…but made with broccoli instead of basil. Pesto is named for the act of grinding the ingredients together, old school in a mortar and pestle but the basil variety is so popular that everyone assumes that’s what you’re talking about when you say the word pesto. But pesto can be made of so many different things – greens like arugula, cilantro, spinach, or peas and even non-green things like roasted tomatoes. So why not broccoli? 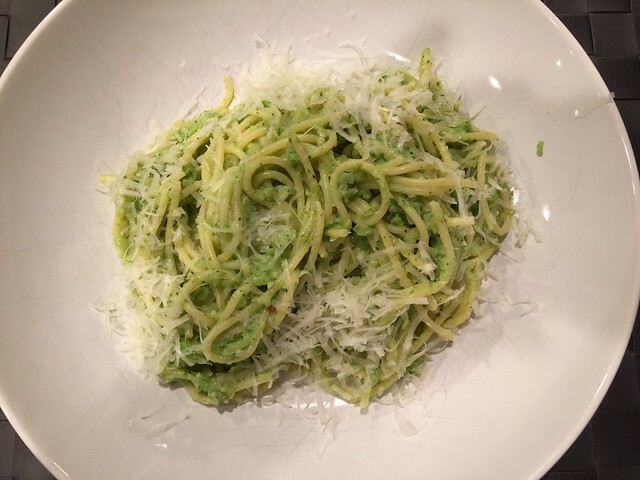 Spaghetti with Broccoli Pesto makes a great vegetarian meal on its own or would be a perfect side for some grilled shrimp, sliced chicken, or pork tenderloin. I love broccoli so one of the things I love about this recipe is that when all is said and done, you’ve eaten an ENTIRE head of broccoli! Sort of like my favorite cauliflower pizza crust, that’s packing a lot of veggies into one dish. 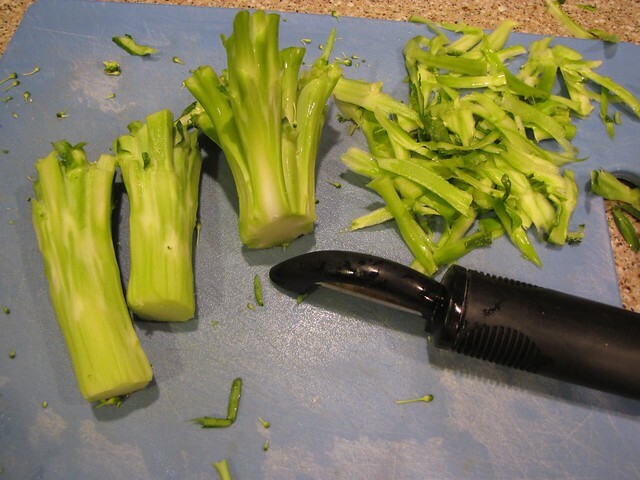 Wash the broccoli and cut off the bottom 1-2 inches of really tough stalks. Cut the florets off and chop them into a medium size. These don’t have to be pretty florets like you would make for a veggie tray, we’re going to be grinding them up so just give them a rough chop so they cook faster. Don’t forget those stems! Guess what? 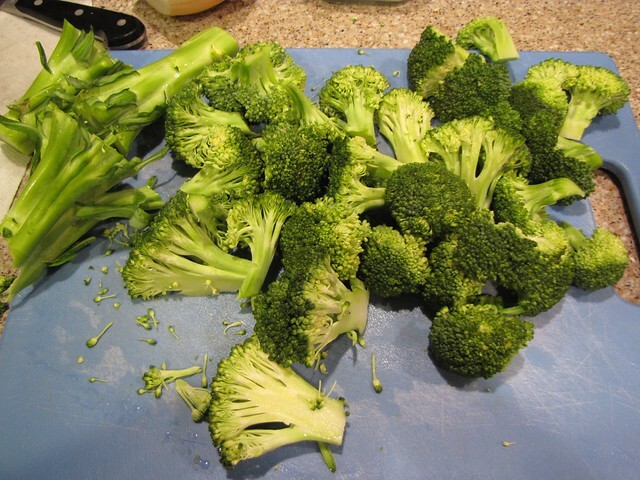 Broccoli stems taste just like broccoli! Don’t throw those out. More veggies. More vitamins. More broccoli bang for your buck! 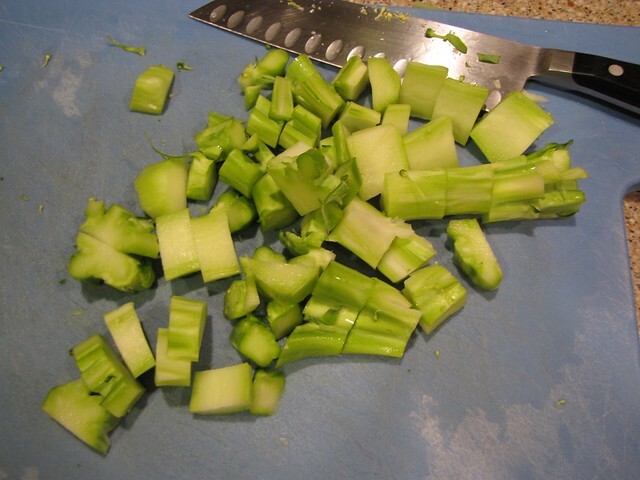 Use a vegetable peeler to trim off the dark green tough outer peel then chop the stems into smaller pieces. 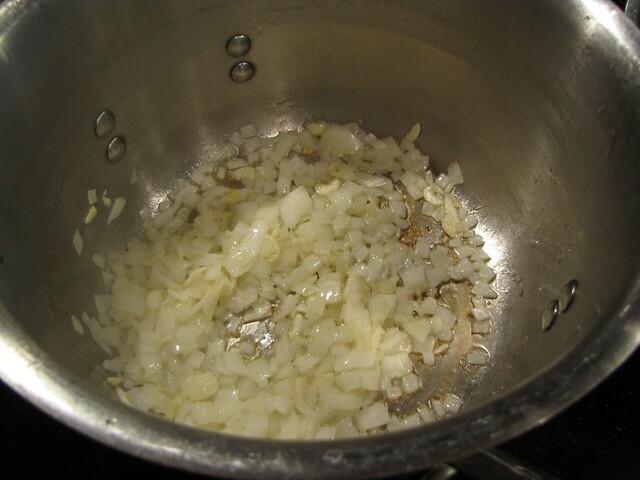 While you’re chopping, finely chop ½ a medium onion, about 1 cup, and 1-2 cloves of garlic. Bring a big pot of salted water to a boil. This is the water you will also be using to cook the pasta. 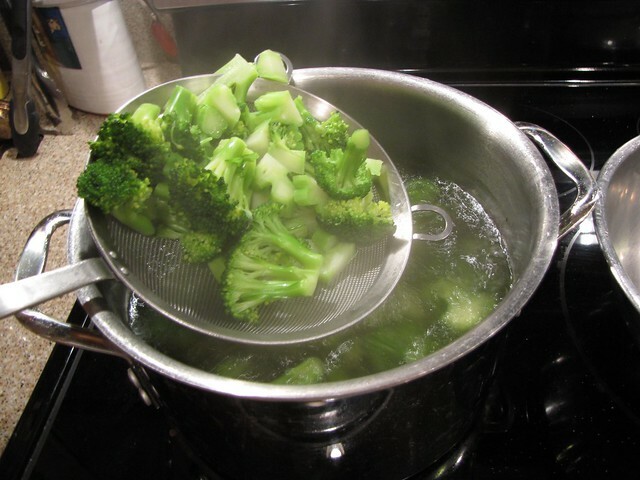 Once the water is boiling, add the broccoli florets and stems and boil just 3-5 minutes, until vibrant green and slightly tender. 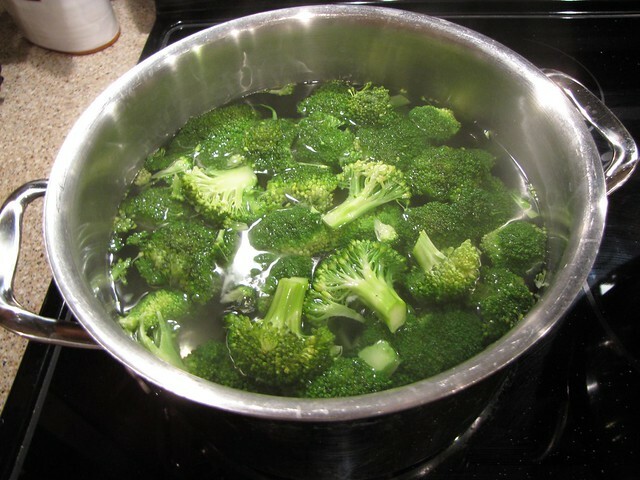 Scoop the broccoli out of the water and place it in a bowl. This leaves all the broccoli flavor and nutrients in the water so you can cook it into the pasta for an extra layer of flavor. This was originally a one-pot recipe but that requires cooking and holding the pasta. IF you are using conventional pasta, you can cook the pasta in this water right now, drain it, and hold it until the end. But if, like me, you are using Gluten Free pasta, it’s best to wait to cook the pasta until you’ve assembled the pesto. GF pasta doesn’t hold so well. So, in another medium pan, melt 1 Tablespoon of butter with 1 Tablespoon of olive oil over medium heat. Add the onion and sauté until golden and tender but not browned, about 5 minutes. Add the garlic, a pinch of red pepper flakes, and salt & pepper to taste and cook for 1 minute more. 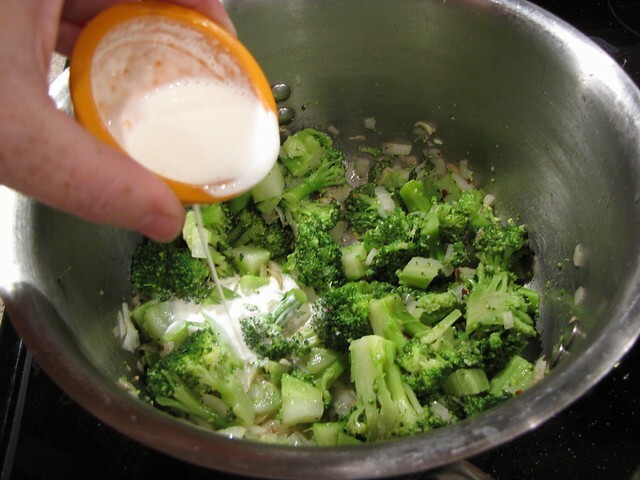 Add your par-boiled broccoli and 4 Tablespoons of heavy cream. 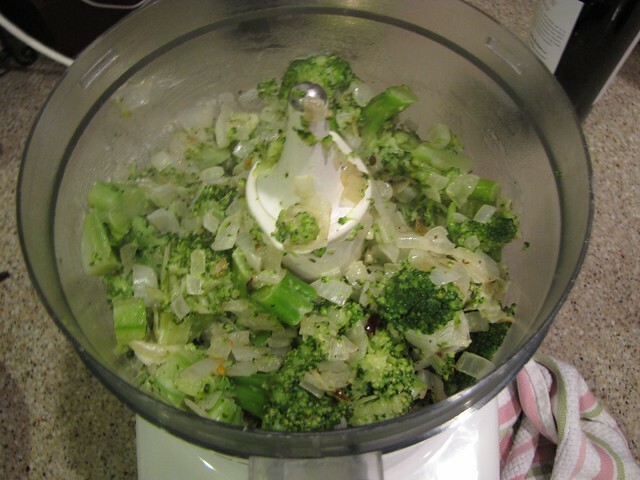 Give everything a stir and cook for 1 minute more then transfer it to the bowl of a food processor. Be sure to scrape ALL of that good cream and onion and garlic out of the bottom of the pan too. Give it a whirl and grind it into a thick, chunky paste. If you haven’t already done so, cook 12 ounces of spaghetti until al dente, tender but slightly firm in the center. 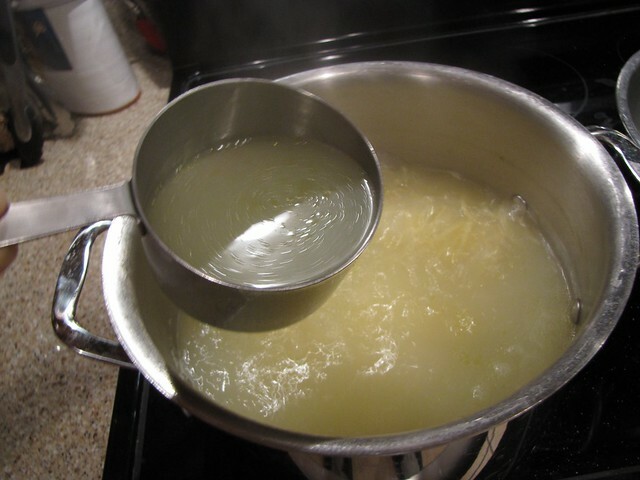 BEFORE you drain the pasta, scoop out 1 cup of the starchy pasta water. You will need this for the pesto. Drain the pasta and return it to the warm pot off the heat. 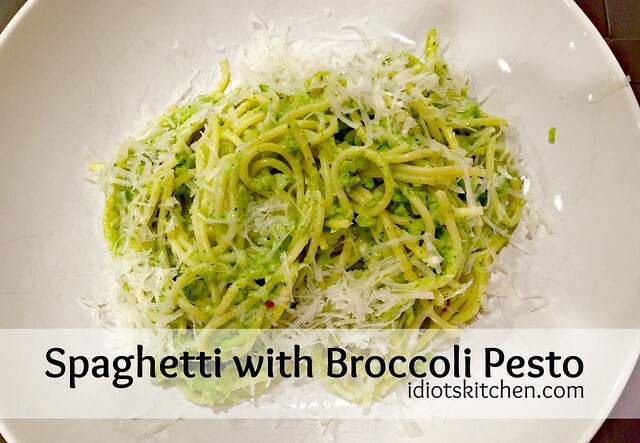 Add the broccoli pesto and stir it into the pasta adding the reserved pasta water A LITTLE AT A TIME to make it saucy and stir-able. 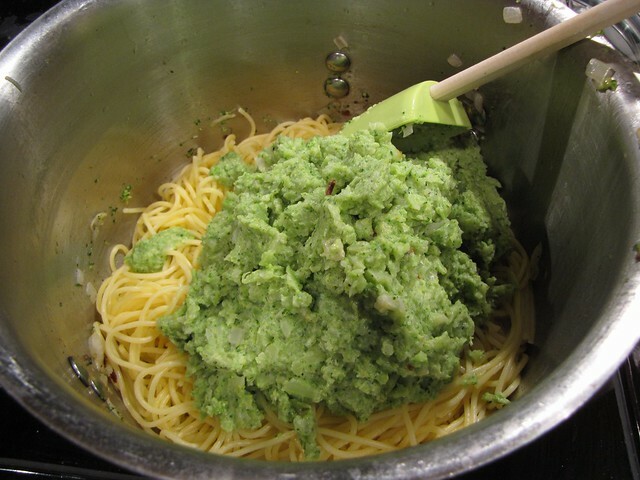 The broccoli pesto will be chunky but by adding the reserved water (I ended up using just over 1/2 cup but you might need a little more or less) a little at a time and tossing the pasta, you will get it to thickly coat the strands of spaghetti in green goodness. Taste and adjust the seasonings of salt & pepper. 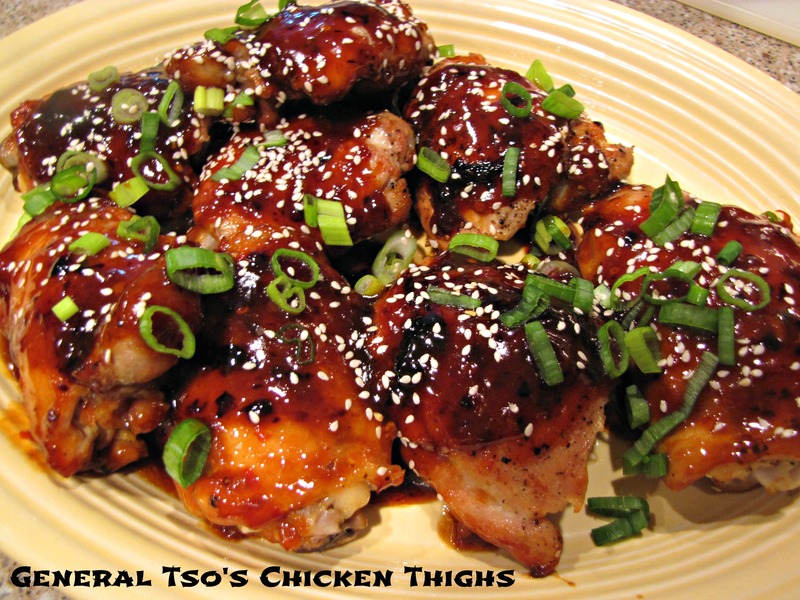 If you like things with a little more kick, add a few chili flakes at the end too. 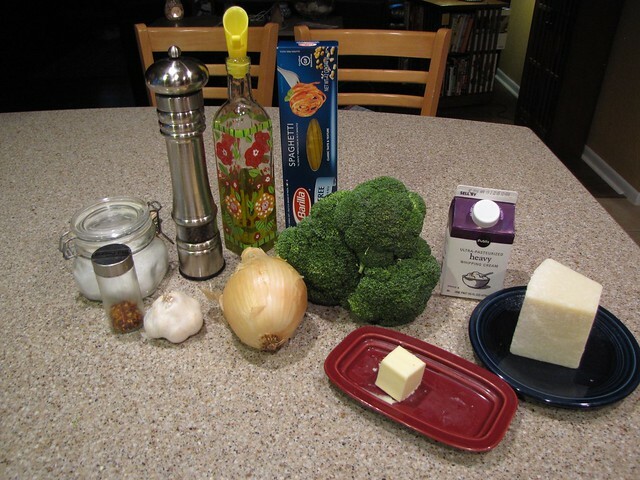 Spoon the pasta into dishes and top with freshly grated Pecorino Romano or Parmesan cheese – because broccoli and cheese are made for each other! 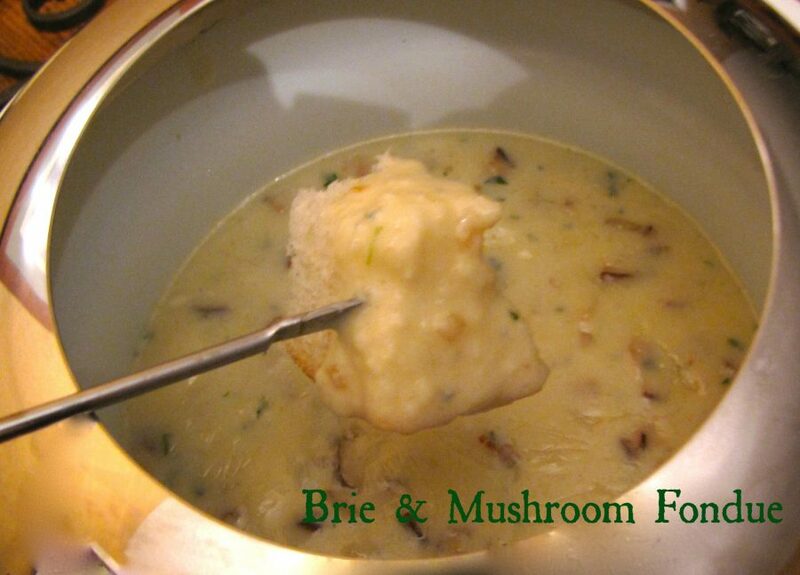 This is light and fresh with a mild broccoli flavor. 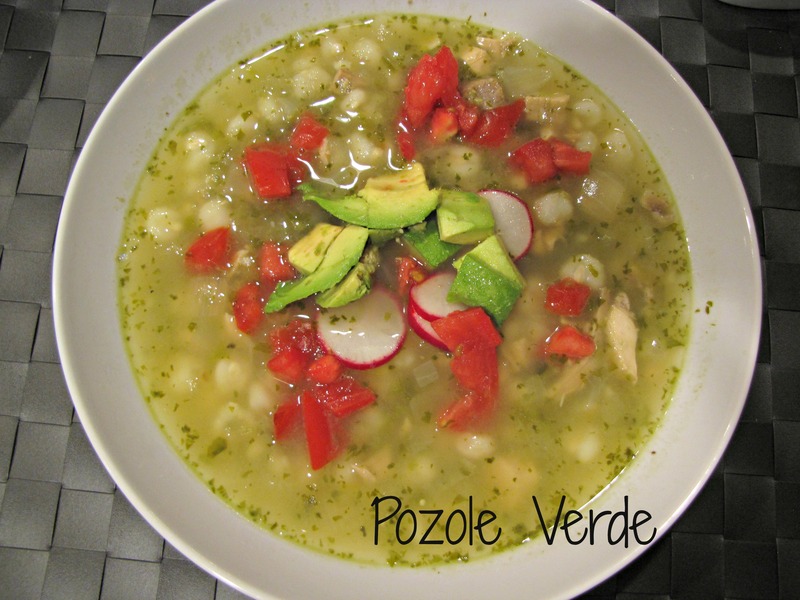 I’m not a big fan of trying to sneak veggies into the food of unknowing diners (or children), but I would guess that you could serve this to kids or people who are luke warm about green veggies and they would love it. We had it just as a vegetarian dinner but I think next time a few grilled or quickly sautéed shrimp will be resting right on top. Speaking of shrimp, Spaghetti with Broccoli Pesto would be a GREAT side for a batch of my favorite quick spiced shrimp. 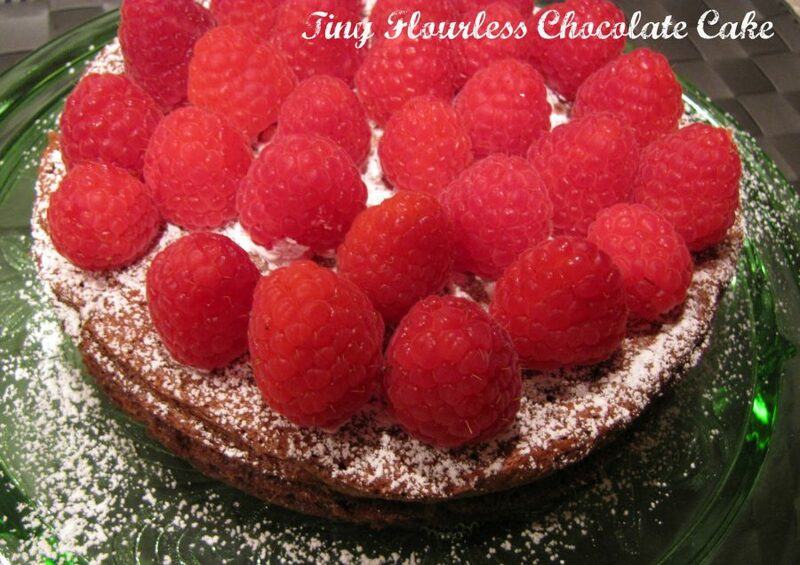 That’s a menu idea that might have to happen this week!